Many tributes have been paid Elisabeth Sladen who died earlier today. Russell T Davies who brought the character of Sarah Jane back to Doctor Who and who later created The Sarah Jane Adventures said: "I absolutely loved Lis. She was funny and cheeky and clever and just simply wonderful. The universe was lucky to have Sarah Jane Smith; the world was lucky to have Lis." Steven Moffat, Doctor Who's current Lead Writer and Executive Producer said:"Sarah Jane Smith was everybody's hero when I was younger, and as brave and funny and brilliant as people only ever are in stories. But many years later, when I met the real Sarah-Jane - Lis Sladen herself - she was exactly as any child ever have wanted her to be. Kind and gentle and clever; and a ferociously talented actress, of course, but in that perfectly English unassuming way." John Barrowman, who worked with Sladen on Doctor Who, posted on twitter:"I loved my time on the Tardis with her. I am proud to have worked with such an icon of the sci fi world, your Dr Who family are very sad and will miss you and your beautiful smile." Keith Jones, Director, BBC Cymru Wales which make The Sarah Jane Adventures, said:"A brilliant presence on screen and on set, she brought the excitement and energy of the Doctor Who family of programmes, of which we are very proud at BBC Wales, to a whole new generation. She will be missed by all at BBC Wales who worked with her." 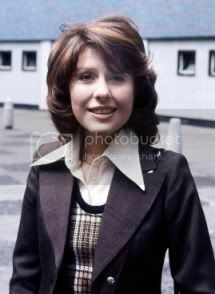 Damian Kavanagh The Controller of CBBC said :"Lis brought joy, excitement and a sense of wonder to her many fans in her role as Sarah Jane Smith. She was adored by our young audience and I know all of them will miss her as much as I will." Roger Carey, who represented Lis for many years, said:"She was not just a client, but a dear friend. She was so positive about life and her natural energy was intoxicating. She couldn't believe her luck when her career was resurrected in her own series." Mary Tamm, who played Romana in the classic series, said: "Sad, sad day. Just heard the news of Elisabeth Sladen's death. I can honestly say she was one of the loveliest women I ever met - beautiful, talented, charming and clever. I was over the moon for her when her career in who was resurrected with the Sarah Jane Adventures; she was brilliant in it. how we will all miss her. Goodbye Liz, you were loved more than you knew, dear friend." Colin Baker: Very sad to hear of the death of Lis Sladen. Great sympathy for her husband and daughter. She was far too young to be lost to them. Mark Gatiss: A tear, Sarah Jane?' Farewell to the wonderful, irreplaceable Lis Sladen. Paul Cornell: Very sorry to hear about Elisabeth Sladen, a great actor, special to everyone of my generation and a whole new one. Gareth Roberts: Can't really find the words. Goodbye, our wonderful wonderful Lis. Lizo Mzimba: Very sad news that Elisabeth Sladen has died. Nicola Bryant: I'm so sorry to have to say I've just had a call to say Liz Sladen has died. It's too much to take in, but it's true. How tragically young. Phil Ford: Sarah Jane was my Companion as a kid. To later know Lis and write for her and share a laugh with her was a privilege. Joe Lidster: The last time I saw Lis. http://bit.ly/9uP9QJ The interview shows her fantastic sense of humour & how much she cared about the show. Lovely. James Moran: Without Elisabeth Sladen, the world is a less magical place. Can't believe she's gone. You'll be missed, Sarah Jane. So much. Toby Hadoke: I hate today, unbelievable. My eyes are stinging with tears. My children will be devastated tomorrow. By God she was good. RIP Lis Sladen. Tom Spilsbury: I feel utterly drained. Farewell, Lis - I'm so sorry I didn't have the chance to say goodbye. We'll do you proud in DWM, I promise. Benjamin Cook: Lovely lady. Met her many times over the years. She was always so kind. Heartfelt condolences to Brian & Sadie. Such sad news. Clayton Hickman: Will miss Lis Sladen more than I can say. A beautiful person and an outstanding actor. Oh it's all too sad for words. Gary Gillatt: A hand, tight on your arm; anxious, uncertain. But you're amazing, you would say. Thank you, she'd reply, are you sure? Yes, Lis. Amazing. Stephen Fry: What terribly sad news about Elisabeth Sladen - her Sarah Jane was part of my childhood. Deepest sympathy to her family. You can listen to a tribute to Elisabeth Sladen from Russell T Davies via BBC News, and BBC Worldwide have published a YouTube playlist of Sladen's finest moments.